The red sock made its second and final appearance of the postseason, as Curt Schilling again needed a minor surgical procedure on his ankle to take the hill. He was again brilliant, giving up just one unearned run over six innings. Orlando Cabrera, Jason Varitek, and Mark Bellhorn provided the offense as the Red Sox streaked to a 2-0 World Series lead. 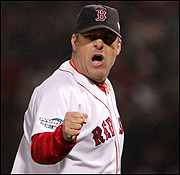 Curt Schilling: “I woke up at 7 o’clock in the morning. That was a tipoff right there. I’ve never woken up at 7 in the morning for anything in my life. I wasn’t going to pitch. I couldn’t walk. I couldn’t move. I didn’t know what happened, but I knew as soon as I woke up there was a problem. “I told (my wife) it wasn’t going to happen. There was no way. But that’s when everything started. I left my house, and I’m driving to the park, and anyone who knows where Medfield is, they know it’s a pretty long haul. “There were signs every mile from my house to this ballpark on fire stations, on telephone poles, wishing me luck. I can’t explain what it was like. “So I get here [to Fenway], and got out of the car, got into the trainer’s room, and Doc [Bill Morgan] was there. “And then it starts happening. You start looking around at your teammates and understanding what you’ve been through over the past eight months, what it means to me.